We’d love your help. 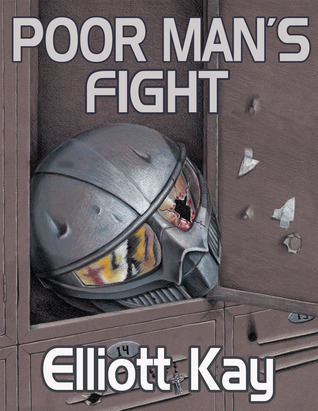 Let us know what’s wrong with this preview of Poor Man's Fight by Elliott Kay. Tanner Malone never bought into military myths of honor and glory. He never wanted to wear a uniform or medals. Yet when family upheaval brings his otherwise stellar performance in school to "This test completes your compulsory education. Congratulations! You have graduated high school. Your financial obligation is 67,879 credits. Please visit our loan officer as you exit." To ask other readers questions about Poor Man's Fight, please sign up. This book has been on my "radar" for some time. It looked interesting and as I like military science fiction seemed something I should try. This is an excellent read if you like action (military action or just plain action), military fiction, military science fiction, etc. And let me add you get what I'd call "ground-pounder" or "grunt" action along with "fleet action:. Also while this will fall under the heading of space opera it's a bit more than the standard brain candy we think of w This book has been on my "radar" for some time. It looked interesting and as I like military science fiction seemed something I should try. Also while this will fall under the heading of space opera it's a bit more than the standard brain candy we think of when using the heading. Going way, way back in the history of science fiction the idea of the "evil corporate" entity has been a standard. Sadly it seems to me that most of the evil corporation plots have been a bit silly. This one comes in with a feasible situation where large corporations have used their financial leverage to gain control of the governing bodies of the planets in the Union. Diehard in space with pirates! I'm not a fan of science fiction novels, although I love scifi movies. This novel reads like a movie. The first scene was entertaining and exciting enough to draw me in. The descriptions and characters are richly developed. The author presents a very unique take on where corporate control of government and skyrocketing education costs will lead if we go on the way we are going. There is also a funny (ironic?) description of a high-stakes "standardized" test. As in many stories, the most interest I'm not a fan of science fiction novels, although I love scifi movies. This novel reads like a movie. The first scene was entertaining and exciting enough to draw me in. The descriptions and characters are richly developed. The author presents a very unique take on where corporate control of government and skyrocketing education costs will lead if we go on the way we are going. There is also a funny (ironic?) description of a high-stakes "standardized" test. As in many stories, the most interesting character is not the protagonist, but the antagonist. I would have liked to learn more about his motives and personality. Kay is a fun author who takes his readers along on a rip-roaring ride. His own military background and knowledge of the operation of a sea-going vessel translated beautifully into his creation of a space-going operational fleet. The reader learns several random interesting facts along the way. Kay might have provided a sentence or two of explanation about certain technologies, especially for readers not familiar with the genre. Each and every minor character seems to be named. After a while I got a bit confused and wondered if I should have remembered who was who. I suspect in order to avoid standard "red shirts" Kay decided to give everyone an identity. Military Sci-Fi at its best - taken from the grunts standpoint. You know the person that makes all the officers look good on a military ship. Sure the lone-man save-things at the end kills the non-officer vibe, but by that time you are so rocking the space opera you don't care. I love the opening concept of school debt, owing about a car payment a month myself for the next ten years (on top of a car payment, rent, and oh stuff like food). I like creating what if scenarios and Elliott Kay has take Military Sci-Fi at its best - taken from the grunts standpoint. You know the person that makes all the officers look good on a military ship. Sure the lone-man save-things at the end kills the non-officer vibe, but by that time you are so rocking the space opera you don't care. I love the opening concept of school debt, owing about a car payment a month myself for the next ten years (on top of a car payment, rent, and oh stuff like food). I like creating what if scenarios and Elliott Kay has taken one I've bounced around in my head (really dude, stay out of my head) - and played it out in this intellectual exercise. Got the picture - making people pay for childhood bad. Love the world creation from the concept though! Very nice military story and can't wait to see more. I don't give out five stars lightly - but if you like solid space opera, you got it here. Side Note: I noticed the author has other works in different genres. Be careful you get the path you want. Kind of like Piers Anthony - people who are expecting Mr. Anthony style to be the same for fantasy and sci-fi are in for a rude awakening. No offense Mr. Kay, I am not going to read Good Intentions as it ain't my style - but please finish that sequel quickly so you can return to the Poor Man's Fight universe. I want the Next! I was initially drawn into the story by the concept of intergalactic pirates and corporate financed education. The more I read, the more I felt like the author was attempting to place their political beliefs (not that I don't agree with some of the politics in the book) into the story. The insertion of the author's personal politics felt a bit forced as well and really jarred me out of the story. I ended up very disappointed in this book which started out so well. 4.5 stars. Read this sci-fi for free (sort of) courtesy of the Prime Reading Library. I enjoyed the sections concerning our hero Tanner Malone as he suffers through basic training and his first posting in the Archangel Navy. Not so keen on the passages involving the evil space pirates, did some skimming. Easily the best space warfare book I have ever read. I have been searching for a book that has some naval ship warfare, and this one has it in spades. The pacing is excellent and there were sections I flew through that lead to many late nights of reading when I should have been sleeping! 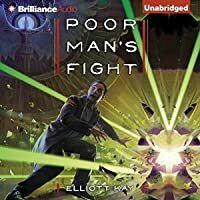 Poor Man’s Fight is an exciting addition to the “space opera” genre. Author Kay expertly lines out and fills in three separate and intersecting stories dealing with a galaxy where corporation are the power behind the political executives. They have paid for exploration of far worlds and they want the maximum return on their investment. They are too big to fail. There are plenty of stories about young people stepping into the adult world. It had been a subgenre in science fiction for most of the Poor Man’s Fight is an exciting addition to the “space opera” genre. Author Kay expertly lines out and fills in three separate and intersecting stories dealing with a galaxy where corporation are the power behind the political executives. They have paid for exploration of far worlds and they want the maximum return on their investment. They are too big to fail. There are plenty of stories about young people stepping into the adult world. It had been a subgenre in science fiction for most of the last hundred years. What singles this book out is how well Kay crafts his characters and how deeply he sets his plot. We are experiencing Tanner Malone’s emotions as he decides to join the Union Navy when his other choices didn’t pan out. “He was supposed to go off to an ecology lab for an internship before university, but it got all fucked up and he didn’t know what else to do….He’s gentle. Nice. I never saw him hurt anyone. All he wanted to do was work with furry animals and estuaries and stuff.” Tanner has a lot to learn. “I’m here to offer you all a choice of your own free will. Maybe the first truly free choice of your lives. Might seem like there’s a gun to your head right now, but we aren’t holding it. “The people who really hold that gun have been there all your lives. NorthStar. CDC. Lai Wa….Those corporations wrote all the rules and they hold all the cards, and you have nothing. So, our boy Tanner owes a lot of money, and without a scholarship, he can’t help but go further into debt for any additional education. The military seems the best choice. We follow him through his basic training where he tries to get by, by getting along. We see how he comes to make further bad decisions and fails to get his life centered. A lot of space operas reflect their authors’ fascination with FTL (faster than light) travel, or weird ordinance, or space war strategy and tactics. Kay shows us little of this. He is strong on his venues and paints interesting details of military life, pirate life and the bonds that are formed. He gives us enough depth to the characters to make us ambivalent about some of their activities or points of view. This is an author worth watching and his second book of the series is already available. Mostanában nagyon nehezen találok olvasnivalót, amit nagy kedvvel tudnék fogyasztani, ezért gondoltam kilépek a komfortzónámból, és bepróbálok egy military sci-fi regényt. Nem volt rossz, helyenként egészen tetszett, de sajnos nem buzogott fel bennem tőle az olvasási kedv. Tanner Malone 18 éves amikor csúnyán bebukja a felvételi tesztjét, így ha nem akar durván eladósodni, akkor nincs más választása, mint belépni az Arkangel rendszer hadiflottájába. Hat hónapos embertpróbáló kiképzés után egy korvett űrhajón kezdi meg a szolgálatot. A fogadtatás inkább hideg mint meleg, a legénység többi tagja folyamatosan terrorizálja a srácot és a leggányabb melókat akasztják a nyakába, valamint nem tanítanak neki semmit. Elég köcsög banda, azután sem hagynak fel a kekeckedéssel, miután Tanner megmenti a fél bagázs életét egy kalóztámadás közben. A kalózok egyébként is igen nagy problémát jelentenek az Arkangel rendszerben, megélhetési gyilkosok nem riadnak vissza több ezer ember meggyilkolásától sem a profit érdekében. Luxus űrhajókat rabolnak el, vagy éppen egy egész bolygóra csapnak le. Mindekez következtében polgárháború dúl a rendszerben és a kormány kénytelen bővíteni katonai apparátusát. A kérdés csak az, hogy mi játszódik a háttérben? Ki mozgatja a szálakat? Absolutely superb military sci-fi. Randomly took a chance on this when it showed up in my Kindle recommendations and I'm so glad I did. Kay does a great job with the military aspect of the book. You follow the main character through his training and initial service, which is all excellently done, but it also has sections from the point of view of a space pirate captain. Getting to see how the pirates operate and rule themselves on the fringes of society and outside the government's influence was Absolutely superb military sci-fi. Randomly took a chance on this when it showed up in my Kindle recommendations and I'm so glad I did. Kay does a great job with the military aspect of the book. You follow the main character through his training and initial service, which is all excellently done, but it also has sections from the point of view of a space pirate captain. Getting to see how the pirates operate and rule themselves on the fringes of society and outside the government's influence was a lot of fun and served as a nice counterpoint to the military chapters. I won't spoil anything, but seeing both of these plot threads develop as the story went along was so much fun. Also has a healthy dose of political intrigue on a galactic scale. Was really the perfect amount, helping to make the book more interesting without bogging it down or distracting you from the thrilling main plot. Never really takes center stage, save for a select few chapters, but Kay makes each one of them count. This is basically the movie Under Siege, but with more back story and more plot armor and less suspension of disbelief. I very much enjoyed the movie Under Siege. We owned it on VHS. Keep in mind, this was before gifs. After a bad day my mom and I would cuddle on the couch together to watch Under Siege. We would fast forward to the part where a bad guy opens a hatch rigged with explosives and gets blown away. We would rewind and replay that bit over and over and laugh and laugh and laugh. That's what we did on bad days before the Internet. Okay, update, I read the prologue and part of chapter one. So that explains why I don't remember anything. thought I was picking up some sort of parable about student debt, which, you know timely, piketty in space, something something. turned out to be an adventure story about space pirates - the number-five ranked* amazon book in the 'space marine' category, no less. but honestly, who's complaining! as space piracy** thrillers go, poor man's fight clicked on all cylinders. *today you/I learned: there is an amazon fiction subgenre named 'space marine'! This is a great book, well worth anyone's time, money and effort. I am impressed with Kay's tight story and outstanding action sequences. If you like military sci-fi, you'll like this book. The opening hook is great, most everyone takes on great amounts of debt at the end of high school. I wish we'd seen more of the corporate oppression in the book, as sci-fi is meant to comment on the present as much as look into the future. There is one mistake that I must nitpick. Tanner says his friend is a This is a great book, well worth anyone's time, money and effort. There is one mistake that I must nitpick. Tanner says his friend is a midshipman at Annapolis, then later says she's at West Point. Yes, both are locations for 'the Academy,' but very different Academies: the United States Military Academy (West Point) and the United States Naval Academy (Annapolis). One trains people to play around in row-boats and the other trains officers to lead Soldiers. As a increasingly crusty Old Grad (USMA 2001), I have to point this out. This didn't affect my 4/5 star review. Kay has got a really good story here. The story is fairly-fast paced but covers the ground well. I didn't feel rushed from point to point. It was more a "here's something good, and then we're going to skip a bunch of boring nothingness, and here's the next good part". I pounded through the story over the course of a couple sittings and ended up wanting more. The combat action sequences were well done. I could picture most of them in my head without a problem. Not an easy thing to write well. The Kay has got a really good story here. The story is fairly-fast paced but covers the ground well. I didn't feel rushed from point to point. It was more a "here's something good, and then we're going to skip a bunch of boring nothingness, and here's the next good part". I pounded through the story over the course of a couple sittings and ended up wanting more. The combat action sequences were well done. I could picture most of them in my head without a problem. Not an easy thing to write well. The dialogue was completely believable and meshed well with the images going on in my mind's eye. Very entertaining and completely gonzo Die-Hard-esque space opera by the end, which rolls to a satisfyingly violent finale after a ropey beginning that has a completely pointless interlude used to infodump non-essential background and a protagonist that starts off like an overwrought Jerry Lewis character. This is the first novel in what promises to be another great series by Elliot Kay. This story has everything you need in military science fiction—great action and memorable characters. It also has the extras that take a book from being fun to great—convincing politics, really rotten bad guys, and a setting that helps build the credibility of the storyline rather than burning it away. Let me start with the setting. The key to understanding Kay’s future society is debt. The major interstellar corp This is the first novel in what promises to be another great series by Elliot Kay. This story has everything you need in military science fiction—great action and memorable characters. It also has the extras that take a book from being fun to great—convincing politics, really rotten bad guys, and a setting that helps build the credibility of the storyline rather than burning it away. Let me start with the setting. The key to understanding Kay’s future society is debt. The major interstellar corporations have succeeded in basically taking over human space by corrupting politicians and effectively tricking the population into enslaving themselves through various kinds of debt. It starts when children are actually children being charged for their education and continues throughout their lives with a thousand tricks to keep the debt rising no matter how hard people work to pay it off. And if that isn’t bad enough, the whole system is secretly rigged to make certain that nobody can actually get out from under the corporate thumb and take control of their own lives. Enter the solar system of Archangel—ninth largest economy in the Union—whose newly elected leaders have constructed a very dangerous plan to free their people from what is effectively debt slavery. This ongoing effort will probably be the primary focus of the entire series, but it’s just getting ratcheted up in this first book. It’s driving the action, but it’s mostly behind the scenes making you wonder which of the many bad things that are happening to and around Archangel are really the result of nefarious corporate efforts to stop Archangel from freeing itself and its citizens. While all of that is happening in the backdrop, Kay spends most of his energy focusing on Tanner Malone. He’s an incredibly bright kid who gets shafted by his parents and the system and ends up tanking on the all-important Test that determines how much money each student owes as he graduates high school. Feeling he is out of options, Tanner joins the navy as a way to start paying down his debt and getting some help with college. The early portion of the novel is a boot camp story that was surprisingly interesting despite the fact that I’ve probably read a couple of hundred other boot camp stories over the years. It’s entertaining and really helps us get into Tanner’s head. The young man really isn’t fit for the military because he really hates the idea of hurting other people. He’s not a pacifist, but he’s really too nice for his own good. Helping him come to the point where he understands on an emotional level why militaries sometimes have to hurt people is a great set up for the crises he faces in the rest of the book. I don’t want to put any spoilers into this review, but I will say that the crises—especially the final one—are exceedingly well done. Tanner accomplishes things that should have had me turning off my book and saying—no, that’s too much—and yet I really didn’t have any problem believing anything that happened. That not only requires great writing, it demands superb characterization. Something that has always been a strength of Kay’s novels. The final thing I want to say about this book is that the epilogue-like ending is a terrific set up for the next novel. I can’t wait to see where Kay is going to take this one. Poor Man's Fight feels very much like an indie: some typos (e.g., there/their/they're), some grammatically awkward sentences (e.g., highly educated people saying things like, "It went good. "), and far too many extraneous or superflous POVs/situations that didn't forward the plot or story. A strong finish wasn't offset by a ponderously slow beginning and middle, unfortunately . Story: The world is ruled by corporations who have essentially used an 'I sold my soul to the company store' scheme to enslave most of humanity into lifelong debt. High school graduate Tanner Malone has no choice but to enlist in the military to pay off some of the debt: he's highly skilled and among the top in his class but made huge mistakes on the final exam that sealed his fate. Meanwhile, Casey is a space pirate 'fighting the man' and 'freeing indebted citizens' through piracy (e.g., he murders all the people on a starliner except the working stiff crews - to whom he offers a chance to join his gang). Andrea works for the President of the US and both are trying to fix the mess corporations have made of the world. Darren worked on a space liner but got a chance to join the pirates - but he soon learns that mistakes are deadly, especially if you aren't too bright. All these characters will collide in an action packed ending. As noted earlier, most of the beginning and middle, dealing with Casey and his crew and troubles, Darren fumbling as a new pirate, Andrea giving press conferences explaining away the pirate situation, and Tanner going through boot camp hell really needed to be edited and streamlined. Transitions through time periods were clunky (e.g., Tanner gets bullied mercilessly and then suddenly he's graduating and the bully is mentioned as being taken care of in an off comment). So much of it just wasn't needed (Andrea especially). Most of the characters felt very undereducated and pretty much talked/acted the same way - lacking nuance. Despite all the POVs, it felt like everyone had the same education and the same outlook on life - frustration and resentment. I wanted more - scenes and situations that didn't feel so set-up by an author so as to make a point, plot or personal. When the action starts at the end and the characters all begin to tie together, it really becomes obvious which POVs weren't needed and which scenes could have been jettisoned to streamline the story. As well, although the action was good, it really turned into a Die-Hard/Rambo type of story of one man against a WHOLE LOT of pirates. Believable? Probably not and that's the achilles heel of sci fi - it really does have to be plausible and this story just wasn't for me. I didn't dislike Poor Man's War but there was a lot of soapboxing here by the author that frustrated. Especially at the beginning I felt like I was reading a thinly disguised personal manifesto by Elliott Key rather than an engaging everyman sci fi story. It was distracting and kept me from investing in the characters when they felt like constructs to make a point rather than actual people. Poor Man's Fight is a book that follows several different point of views, mainly Tanner Malone. Tanner lives in a world where the government believes that instead of paying for school through your parents' taxes, you have to pay for it yourself. At the end of high school everyone does a standardized test, and the better you do on it, the less money you owe to the government. Tanner thought he'd do well, but stress the night before his test from his family caused him to owe over 60000 credits. Instead of going to university like he wanted to, he chooses to enlist. We follow him through boot camp and his life after, as he trains and fights space pirates. This book was a military sci-fi. I can't say I've read one of those before, but I've read military and sci-fi books on their own before. I've enjoyed military books in the past, so that's not the reason I disliked this book. In fact, the military bits were my favourite parts. My issue with this book was the fact that it hopped all over the place way too much. As I mentioned before, this is a book with a lot of perspectives. I've read books like that and sometimes they turn out well. This one, I found, did not. As soon as the book got to a part where I began to feel slightly interested, we suddenly moved to another perspective for over half an hour of reading time. By the time the book went back to the perspective that was getting interesting, I was too annoyed to care what was happening. It didn't help that each chapter was 30-40 minutes long in reading time and that it had over 6000 kindle locations. The book seemed to drag on forever. The thing that bothered me most at the beginning was that it was so hard to discern what was going on. I spent the first quarter of this book simply trying to understand, and it's quite hard to enjoy a book when you're trying to put things together in your head because the author didn't explain it well enough. It got better towards the end, but all of the things I disliked added up and made me not want to continue the book which made me spent a very long time finishing it. This was a strange book to read. Many stories have two storylines that eventually come together but the general feel is usually the same in both. In this case, it felt like two totally separate stories for about half of it. The first was a young-adult science fiction coming of age and the other was space pirates. Interesting blend and it did work but it took until towards the end before I decided I liked it. In this future, humans have gone off to live in other solar systems. Tanner is living in This was a strange book to read. Many stories have two storylines that eventually come together but the general feel is usually the same in both. In this case, it felt like two totally separate stories for about half of it. The first was a young-adult science fiction coming of age and the other was space pirates. Interesting blend and it did work but it took until towards the end before I decided I liked it. In this future, humans have gone off to live in other solar systems. Tanner is living in the system originally colonized by the Catholics (religion doesn’t really come into play much but it is relevant to one issue I had). In this future, children are responsible upon graduation for the costs incurred to educate them. They can lower these costs by doing well in school, specifically in the final exam. Tanner is brilliant but he just found out his family was moving to another planet the night before his exam so he bombed it thus leaving him in a pile of debt. He will have nowhere to live and he can’t afford to continue his education. The only choice he has left is to join the military. Elsewhere in the universe, a huge band of space pirates are taking over spaceships (and colonies, and planets…whatever they can get away with). They use the takeover as an opportunity to recruit new pirates in addition to getting rich. - I wasn’t surprised by the ending. You pretty much know from the start the general plot, although there was one tiny twist at the end which may make the sequel, Rich Man’s War, more interesting. - When Tanner was assigned to a ship after his basic training, everyone there treated him awfully. This is where the religion aspect bothered me. The captain of this ship made it a point to have the crew pray before missions and say grace before meals, but he was OK with Tanner being treated like garbage. Not very Christian of him. Perhaps he forgot about the “do onto others” rule but I found it out of character for someone who is supposed to be religious. It shouldn’t have even been mentioned in the story. That’s it, or at least that’s all that really stuck out that bothered me. Decent story but it could have been more. Maybe it will be in book 2. Reading (listening on Audible) all three books back to back to back. Finishing up the third now. This book is flawed with some really sketchy ideas about how corporations work in the real world. The whole education debt idea is crazy to say the least and while supposedly a version of a federated democracy I guess the people seem to not actually have any power. Someone said this was like a book written by a staffer from Nancy Pelosi's office I would add that the economics and government were mayb Reading (listening on Audible) all three books back to back to back. Finishing up the third now. This book is flawed with some really sketchy ideas about how corporations work in the real world. The whole education debt idea is crazy to say the least and while supposedly a version of a federated democracy I guess the people seem to not actually have any power. Someone said this was like a book written by a staffer from Nancy Pelosi's office I would add that the economics and government were maybe designed by Pelosi and pirate part was from Maxine Waters. It's just that insane to have a system set up like this is. Elliott did make me go take a hard look at my property tax records and in he could assure me that $65000 per kid was all I needed to pay I would sign the heck up. As far as Tanner the main protagonist goes he is easy to like if you don't think too much about his actual behavior and goals. I'm not normally a huge sci-fi fan, much less a military sci-fi fan. This book more than held my interest, though. It captivated me. It starts off as almost a dystopian future novel, but rapidly ramps up into a full-blown military sci-fi romp. The boot camp part of the story is quite entertaining, but it gets even more-so as the main character starts to see real action. The strength of this book is in two main areas: the main character and the action. The main character is very human, something I'm not normally a huge sci-fi fan, much less a military sci-fi fan. This book more than held my interest, though. It captivated me. It starts off as almost a dystopian future novel, but rapidly ramps up into a full-blown military sci-fi romp. The boot camp part of the story is quite entertaining, but it gets even more-so as the main character starts to see real action. The strength of this book is in two main areas: the main character and the action. The main character is very human, something that often seems lacking in serious military books. For very few is it realistic that someone who goes to war shows no effects from killing. Most have some sort of mental impact, something that comes from it. I found the main character very easy to relate to and very realistic, given the situations. As I said, I'm not really a fan of military sci-fi, which makes me think this was a very, very well written story to catch my attention in such a way. The fight scenes kept me interested, even the space combat. The hand-to-hand scenes were fast-paced with more than enough detail to see them in my head. I really enjoyed them, and the climax of the story kept me glued to my book. The ending is good. I don't know how else to describe it. Feels somehow appropriate, fitting. I came away from this story with some things to think about, which is more than I can say about a lot of books I read. I really enjoyed this book. The author was obviously well-knowledged in military training, methods, tactics, etc.. It was a plausible plot and unfolded evenly and kept my interest. Though the ending was a bit…miraculous, I should say, the inevitable questions that arose in my mind—as the story presented its many remarkable outcomes—were answered sufficiently. The characters were likable—even the bad guys, to some degree—and I could relate to their situations. The action was exciting—not too long I really enjoyed this book. The author was obviously well-knowledged in military training, methods, tactics, etc.. It was a plausible plot and unfolded evenly and kept my interest. Though the ending was a bit…miraculous, I should say, the inevitable questions that arose in my mind—as the story presented its many remarkable outcomes—were answered sufficiently. The characters were likable—even the bad guys, to some degree—and I could relate to their situations. The action was exciting—not too long, not too short. And I liked the main character’s humbleness and simplicity. Student loan debt as a reason for war? Like many people these days I have student loans, and while I may feel like grumbling about it, I've never wanted to shoot anyone over them. Of course I don't have the kind of debt that recent graduates have either. The launch point of this series is that on graduation you are tested to see how much you learned to determine whether you must pay back the money spent or not. This debt is crippling not just people but also governments. In order to pay off his d Student loan debt as a reason for war? This was a fantastic book. It was exciting, compelling, full of surprises , and extraordinarily well written. The protagonist was incredible. He was smart, highly conflicted, emotional, and extremely innovative. I sort of highly related to him. After bombing a year in college I lost my school deferment. That led me to be drafted after 4 weeks of Marine Corps boot camp. What a double hoot that was. Anyway I spent a very eventful 13 month combat tour in Vietnam. I highly recommend this book with no qualifiers. This was a great book. My best test of a book is my inability to put down my iPad before falling asleep. I finished this book in three days as it was impossible for me to stop reading. The characters were well thought out, the dialog was snappy and fun to read, and the descriptions of places, training, and fights was well done. I will support this author any way I can as I love his works. This was a surprising book. Excellent and fast paced read. Military sci-fi in the vein of John Scalzi. While I'm not crazy about the title or the cover art, this book raised a lot of social-political as well as being a very well written adventure with a great lead character. Highly recommended, even to those not big into sci-fi. I couldn't get past the first 150 pages which sounded like a rant of someone who loves government and politicians and who things our enemy are the businesses that employ us. I'm sure Obama and Nancy Pelosi would enjoy his philosophy.